Are you positive that your beloved pet isn't cheating on you? Cats are known for being troublemakers. When they're not sleeping on your face or stealing your credit card to buy games, they're doing something equally mischievous elsewhere. 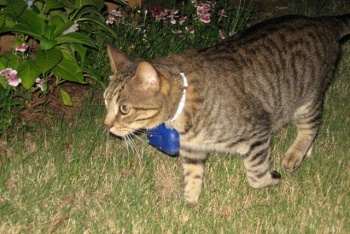 Now, thanks to the efforts of a dedicated researcher and some feline volunteers, you can get a better idea of what kind of hijinks your cat gets up to when you aren't looking - via adorable collar-mounted cameras. These three-ounce CatCams, as I like to call them, were affixed to the furry necks of 60 housecats with the permission of their owners. The cats spent about four to six hours outdoors each day for a period of seven to ten days, accumulating over 2000 hours of video footage. The results did not disappoint: the cameras revealed a surprisingly high level of predation on wild animals, and 85% of the cats demonstrated risky behavior throughout the week. "Cats aren't just a danger to others," reports USA Today, "they're also a danger to themselves. The cats in the study were seen engaging in such risky behavior as crossing roadways (45%), eating and drinking things they found (25%), exploring storm drains (20%) and entering crawl spaces where they could become trapped (20%)." Male cats were found to be more daring than females, and younger cats used less caution in their escapades. The pets surprised experts with the number of kills they racked up over the week. Cats ate 30% of the critters they killed, and brought about a quarter of the carcasses home as trophies. However, nearly half of the cats' victims were left behind to rot - a statistic that researchers had not taken into account when estimating the effects of housecats on local wildlife. Perhaps most shocking was the scandalous revelation that four of the 60 sampled cats were leading double lives. Unbeknownst to the cats' proper owners, whole different families of humans were welcoming the wayward pet as a regular visitor. "I feel like one of those women on the talk shows," said Amy Watts, the owner of one the two-timing cats. "'My husband has two wives' ... my cat has two families!"